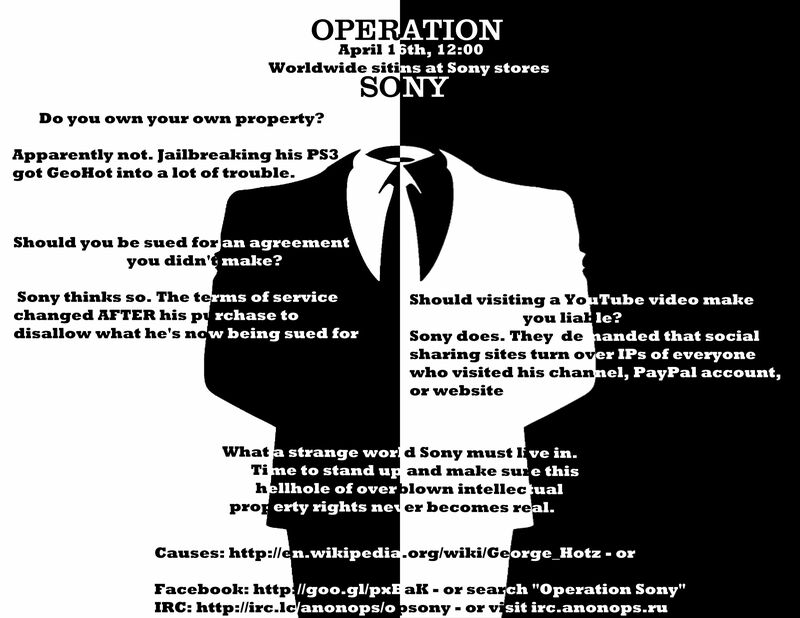 Anonymous and Sony have been in the news a lot lately, and the story has taken a new twist after Anonymous revealed what they plan to do next. They had allegedly been targeting some of the company’s websites and its PlayStation Network much to the dismay of many gamers. But now the group is changing tact to target Sony stores. Lawrence Latif from the Inquirer is reporting that now the group is going to focus its actions on the company’s stores. This follows on from the report we gave you about Anonymous stopping their action on PSN as they didn’t want to cause problems for gamers. The in-store protests are set to take place around the world at Sony retail outlets, but exact locations and time have obviously not been given. This kind of action will hopefully remain peaceful, but Anonymous will have a bigger chance of bringing their cause to the general public. Whatever happens with the latest cause of action it’s not likely to be a small demo. All this started from PlayStation hacker George Hotz, who now faces legal action from Sony for his exploits. Sony has tried to stop the information he posted on the web about jail breaking the PS3. How do you feel about Anonymous plans? Sony's security needs to step it up. Not saying " Go Anonymous" because I'm very upset at the fact that I can't play CoD: Black Ops since wednesday. LOOK GROW UP, STOP ACTING CHILDISH AND STOP ATTACKING SONY, YOU ARE STOPING INOCCENT PEOPLE FROM GOING ON PSN. I MEAN WHAT HAVE SONY DONE TO YOU, NOTHING THATS WHAT. YOU WOULDNT LIKE IT IF SONY KEPT ATTACKING YOUR STUFF. SO GET A LIFE AND GROW UP. DO SOMETHING MORE PRODUCTIVE WITH YOUR LIFE INSTEAD OF ATTACKING SONY FOR NO GOOD DAMN REASON.